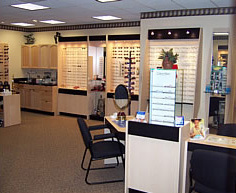 When you visit our eye-wear boutique, you get the widest selection of high quality frames, lenses and coatings to meet the specialized needs of everyone in your family. For adults, eyeglasses are often a wardrobe accessory. That's why you'll find more than 500 of the leading names in frames, including Jones New York, Nine West, Guess, Flexon, Columbia and Anne Klein, at our office. Plus, you'll get assistance with lens selection to ensure the total quality of your eyeglasses. We're experts in helping you get the proper lens type as well as the thinnest lens possible based on your prescription. Dr. Gold is your contact lens specialist. He fits patients who haven't been successful in the past: astigmatism, bifocal, scarred corneas, keratocorus, cosmetic & prosthetic contacts. Many facilities sell contact lenses, but few have the experience or access to as many brands as does Dr. Gold. Fitting contact lenses "properly" is a science and an art. It all starts with a proper medical history to determine if there are any conditions which affect success. Allergies, arthritis, dry eyes and medications may necessitate special contacts to optimize success. A social history is taken to determine special needs, such as workplace, sports, social and cosmetic concerns. The eyeballs and eyelids are then measured for size curvature and position. Special considerations to be taken into account are astigmatism and presbyopia. The art of fitting contact lenses involves having many different brands to choose from, as well as access to specialty brands where conditions warrant their use. Because of our expertise, Sunrise Eye Associates has been chosen by many contact lens companies to serve as a "test" site for many newly released lenses. Proper staff training and follow-up care also optimize our fitting success rate. Patients return to ensure an exceptional fit... not just an acceptable fit. Contact lenses are available for children age 6 and up. Many parents are concerned that their children can't or shouldn't wear contact lenses. This fear stems from either responsibility/care issues or price. Sunrise Eye Associates takes the proper approach to fit, train and monitor the contact lens needs of children. Disposable contacts are extremely affordable and eliminate the costliness of conventional lenses. Their frequent replacement schedule also lessens the risk of complications. In general, contact lenses for children are great for improving self-esteem and addressing sports needs. Of course, we carry all the popular brands of disposable and planned replacement contact lenses, such as Bausch & Lomb, Vistakon, Ciba and Coopervision. And you'll always receive expert in-office support in proper handling and care procedures to ensure your satisfaction and eye health. Everyone wants sunglasses that look great on them. But sunglasses are also an important part of eye health and there's a big difference between off-the-shelf store brands and what we provide at Sunrise Eye Associates. We determine your particular sunglass needs whether you plan to wear them for driving, relaxing at the beach or participating in outdoor/sports activities. And our staff members help you make the right decisions on the intensity and color as well as frame and lens type, so that you get sunglasses that look great and do the job. Is there a soccer player or swimmer in the family who needs corrective lenses? Maybe you have a physically demanding hobby or job and your current glasses aren't rugged enough. Come on in and check them out. Our boutique carries a wide assortment of frames for children. Concerned that the eye-wear won't hold its own against rough-and-tumble play? For your peace of mind, all of our children's glasses are equipped with polycarbonate impact safety lenses. And, as we do with eyewear for adults, we carefully ascertain children's vision requirements and learn about their lifestyle, so that we can recommend eyewear that works for them.